What Are the Health Benefits of Bay Leaves? Most people are familiar with the bay leaf as a culinary herb used to season soups and stews, but it also has a centuries-old reputation as a medicinal herb. The bay leaf's effectiveness in treating many of the conditions it was originally used to treat has not yet been proved, but modern science has found two surprising applications that may have a place in modern medicine. 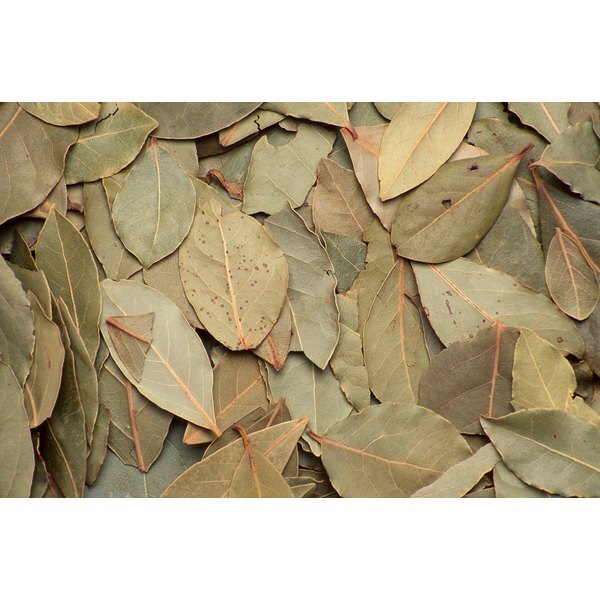 Bay leaves have been used medicinally for centuries. They were eaten fresh or dried and infused into warm water to be taken internally for a variety of ailments. The resulting infusion was a diuretic, increasing urination to remove excess water from the body, and an emetic, to induce vomiting. Bay leaves also have astringent properties, which could help stop secretions due to infection and help reduce excessive sweating brought on by illness. None of these traditional uses have been backed up by modern science, but current technology has allowed for deeper investigation that has revealed startling results. Traditional herbalists knew that a bay leaf poultice or wash could help heal wounds, but modern science has discovered just how well it works. A 2006 study in the "BMC Complementary and Alternative Medicine" journal found that rats treated with 200 mg of bay leaf extract per kilogram of body weight experienced accelerated wound closure and healing within 10 days. A 2011 study in the journal "Natural Product Research" discovered why -- bay leaf extract was found to have antimicrobial activity against some of the most common pathogens, including Staphylococcus aureus, Streptococcus pyogenes, Aspergillus fumigatus and Candida albicans. A 2009 study in the "Journal of Clinical Biochemistry and Nutrition" expanded on previous research into the effects of bay leaves on blood sugar and investigated the effects on humans with Type 2 diabetes. Participants who received 1 g to 3 g of ground bay leaf per day for 30 days experienced a drop in blood glucose, cholesterol and triglycerides. Because diabetes increases your risk of heart disease, the fact that bay leaves not only improved insulin function but simultaneously improved markers for heart disease was an encouraging result. More research is needed, but the results are promising. There are several types of plants that are called bay leaves, but the only true bay leaf is Laurus nobilis. Leaves from any other plant cannot be said to have the same health benefits, and some can be toxic. According to the Herb Society of America, the Kalmia latifolia is poisonous, even though it is related to and looks similar to the bay leaf. Leaves of the California laurel, or Umbellularia californica are sometimes sold as "California bay leaves," but they can damage the central nervous system and cause respiratory distress when inhaled. Angela Brady has been writing since 1997. Currently transitioning to a research career in oncolytic virology, she has won awards for her work related to genomics, proteomics, and biotechnology. She is also an authority on sustainable design, having studied, practiced and written extensively on the subject. What Are the Benefits of Curry Leaves?